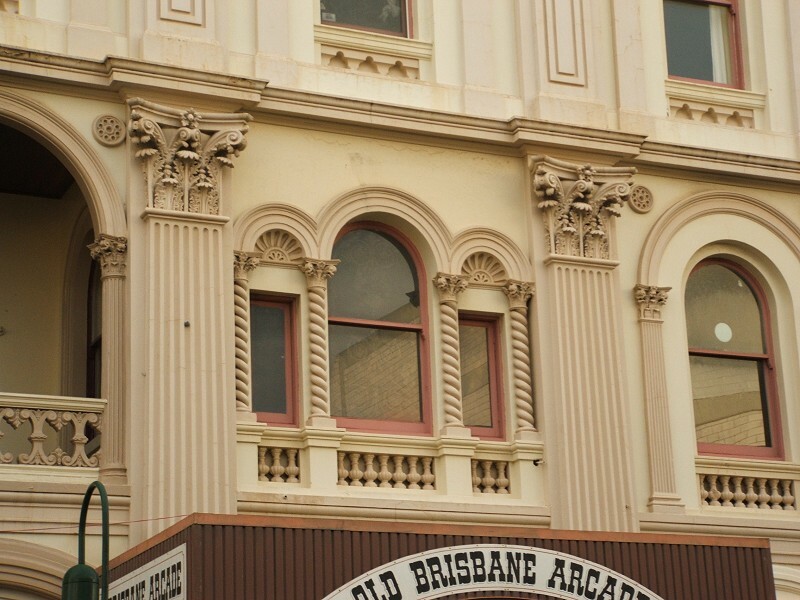 Brisbane Street/The Avenue, now Old Brisbane Arcade. Google Maps. First licensed 1835, as the King’s Head (although see below). Substantially remodelled 1888. Interior demolished 1960s and converted into arcade. 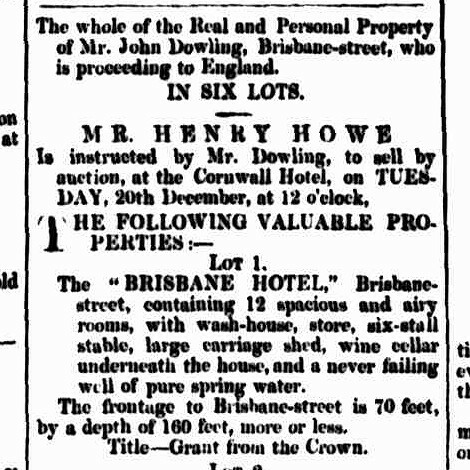 1854 John Harwood, Brisbane Hotel, Brisbane Street. So far there is no continuity here from the King’s Head to the Brisbane Hotel, except through local/oral history (some of this is below). On a 1856 map, Barrett owned land in Brisbane St one block from the George Street intersection i.e. the location of the Brisbane Hotel, so it’s quite likely he had his hotel on land he owned. 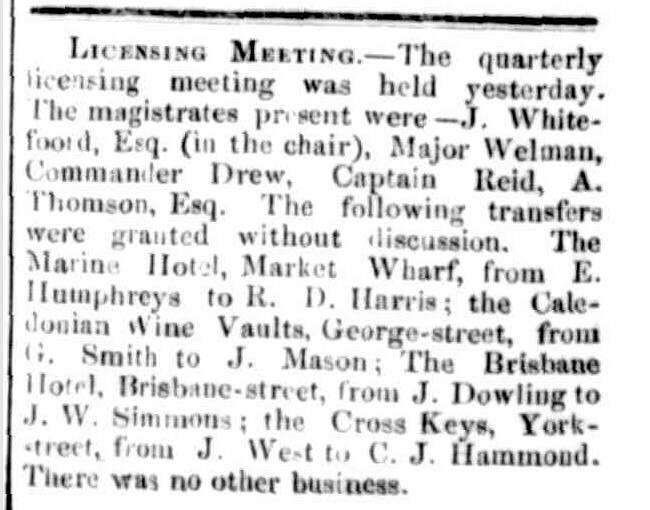 Prior to the King’s Head, Joseph Barrett is licensee for the Mermaid, also in Brisbane St. Was this on the same site? 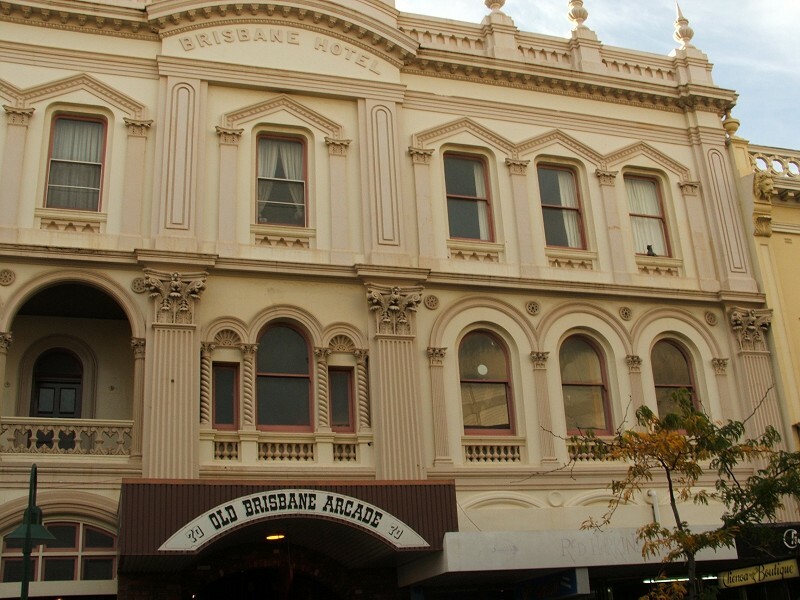 The old Brisbane Hotel, which was erected in 1850–a contrast with the present commodious and up-to-date building. 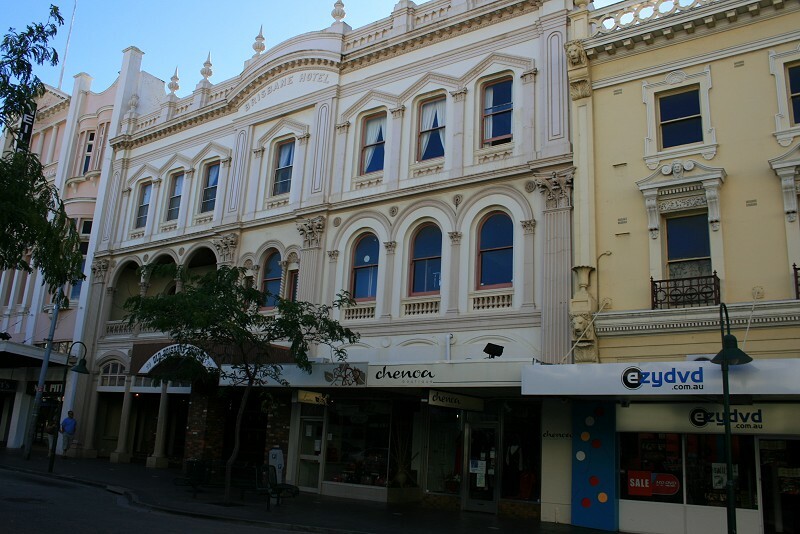 Brisbane St, prior to remodelling of hotel (next to the large building on the corner is a gate, then a small square building with door and window (as can be seen on the right in the photo below) and just above that the roof of the main building, set back from the street). These following extracts give a history of the site prior to the 1880s. 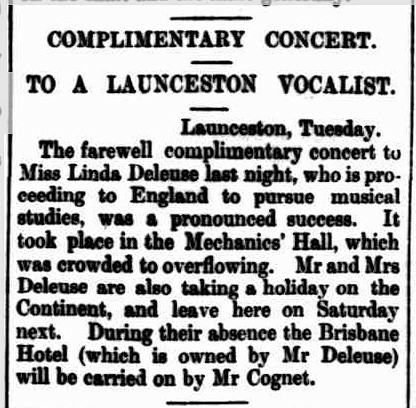 There are some factual errors (e.g the premises were known as Brisbane Hotel prior to Simmons taking over & there’s no indication there was ever an Elphin Arms anywhere in Launceston) but some of it is correct. So make of it what you will. 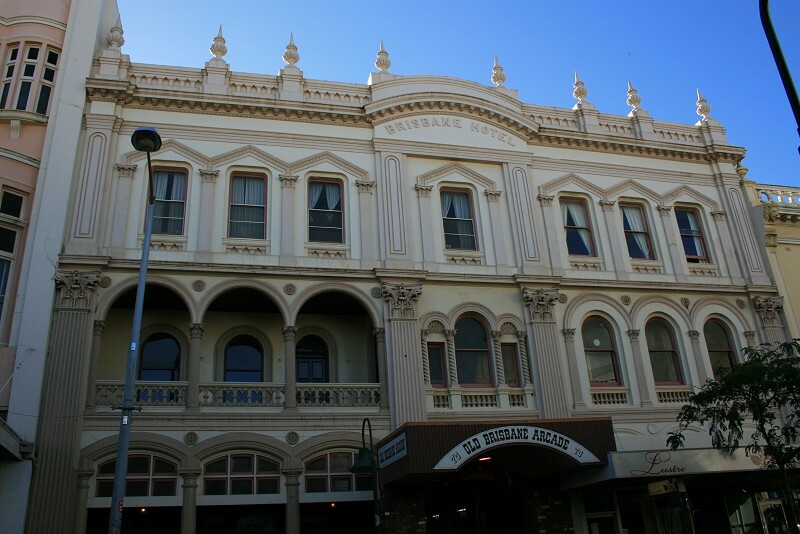 Few who have noticed the demolition of the older portion of the Brisbane Hotel, to make room for a more modern structure, are acquainted with the history of the old building, or the fact that on or near its site was erected the first building in Launceston. …about 1807 Dell was sent up with three privates and some prisoners to build a block house near the junction of the two rivers. He selected a site where the Brisbane Hotel property now stands because it was level; there was very little scrub (merely ferns, which afire soon cleared out), and the gum trees were not very thick. A block house was built of logs, and a track was cut down to the river somewhere about where George-street now is, there being a a sort of blind creek running down to the river. The town was properly surveyed and mapped out by Surveyor Symes in 1825-6, one result of the survey being the removal of the old block-house, and the site of the Brisbane Hotel subsequently passed into the possession of Lieut. Thos. Ritchie, who lived on it for a time, and traded to Sydney in his own vessel. 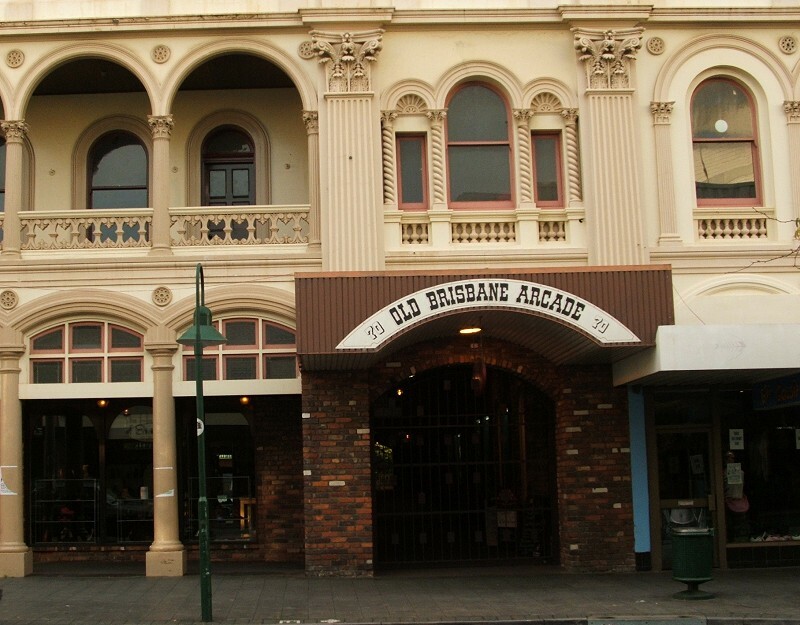 … The Brisbane Hotel site then passed into the hands of Mr. Joseph Barrett (father of a popular ex-mayor, now resident in New Zealand), who replaced the wooden structure by a one storey brick building, which he subsequently raised upon and made two-storey. He kept the place as a hotel for many years, under the style of the Elphin Arms. It was then closed, and afterwards leased to Mrs. Joseph Hudson for a girls’ boarding school. When she removed it again became a hotel, and has never ceased to be used for this purpose up to the present day. Mr. Dowling (afterwards of Table Cape) had it, and was succeeded by Harwood ; and the property was then secured by Mr. J. W. Simmons, who christened it the Brisbane Hotel, and made great additions and improvements, building a side-bar, bed-rooms, outbuildings, etc. With its long and creditable career under Mr. Simmons, its sale about eighteen months ago to Mr. E. H. Panton, and its transfer some three months ago to its present owner, Mr. Auguste Deleuse, our readers are too familiar to need a repetition of details. 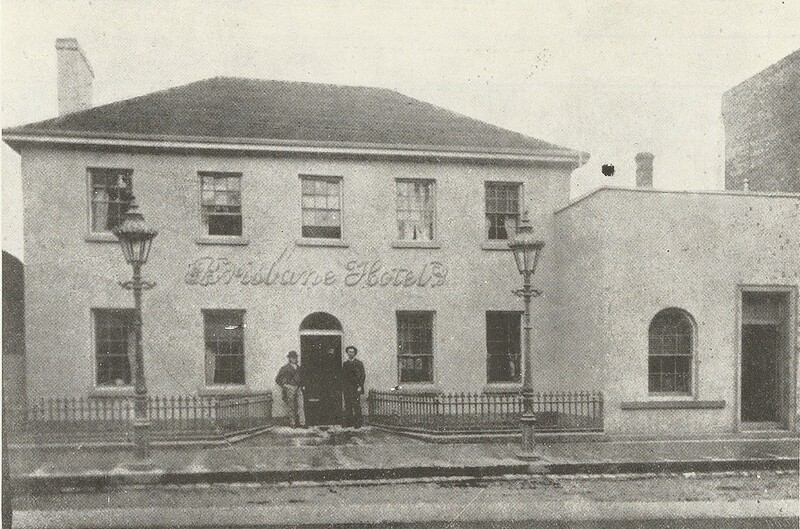 In 1842 Barrett kept the Brisbane Hotel, then known as the King’s Head, having a swing board over the footpath with the head depicted on both sides. It was not, as Mr. Whitfeld says, the Elphin Arms’ there was no such sign in Launceston. During the meeting, the police magistrate frequently remarked that the licensed victuallers were a body of well-conducted men, and he had found the whole of the houses on inspection to be cleanly, &c. ; he spoke more particularly of Mr. Huxley, of the “King’s Head” — this house was furnished fit for the accommodation or persons of the first respectability. 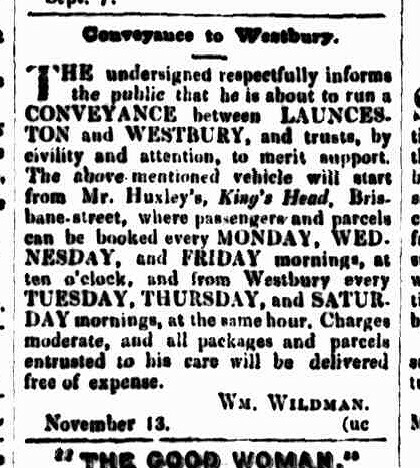 The only other references, so far, for the Spread Eagle in Launceston are from advertisements from auction sales in the 1830s. This is the only reference to Mrs Hudson on the site. Her school is mostly advertised as being in St Johns (Princes) Square area. 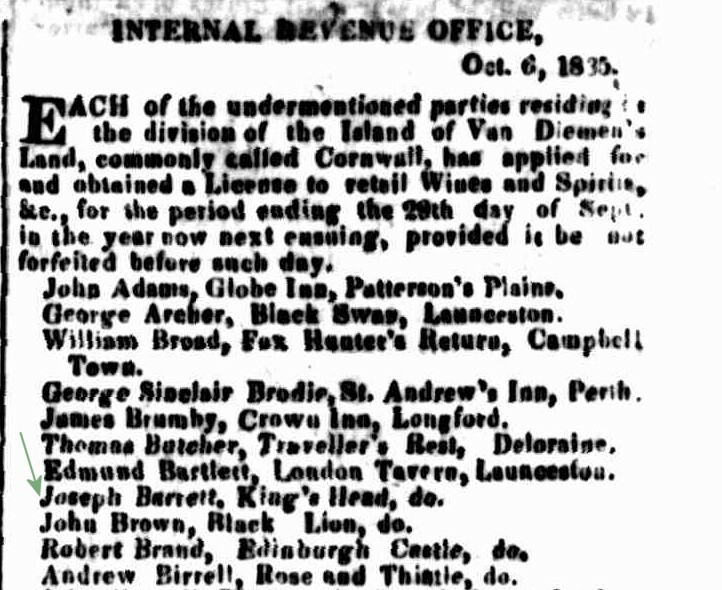 At the land sale by Mr. Howe, on Tuesday last, at the Cornwall Hotel, there was a good attendance of town and country gentlemen. Eighteen allotments adjoining the Township of Deloraine, of 18 and 10 acres each, brought from £14 to £11 per acre. Mr. Peters’ house in Cameron-street was knocked down to Mr. Alexander Rose for £2150. The Invermay property was sold privately to Mr. W. Headlam for £2000 ; two allotments at Deloraine £100 each ; Mr. Kennedy’s house in Spencer-street, which was sold privately for £565, was put up for the purchaser and again sold to the Rev. Mr. Hale for £600; Mr. Hammond’s cottage brought £200 ; the Brisbane Hotel, having been let to Mrs. Lukin for another party at £200 per annum for seven years, was not put up; Mrs. Synnott’s house in Canning-street was bought in at £2600. The other properties were also bought in at high prices. MR. RICHARDS AGAIN. -Yesterday about noon, a fellow went into the Brisbane Hotel, ordered a lunch of bread, cheese, and liquors, and then lay down stupidly drunk, saying he had no money to pay with. Mr. Harwood went to the Police Office, reported the case to Constable Kelly, who, on going to the Brisbane Hotel, found the man drunk as described He took him to the watch house whore Mr. District Constable Richards was on duty; but he declined to take the charge. stating that the man was sober, and commenced what is termed in military phrase, “putting him through his facings” Constable Kelly took the man before the police magistrate, who at once said he was very drunk, and directed that he should be locked up, and the charge entered against him. Two informations were heard. One was laid by Mrs Jane Noon against John Harwood (formerly of the Brisbane Hotel, or Robin Hood and Little John) for assaulting her at her own door In Bathurst-street. Plaintiff and her husband, it appeared from the evidence, keeps a butcher’s thop in that locality, and Defendant on last Saturday morning came opposite their door with some meat on hols shoulder and said he could sell it cheaper than them by three pense a pound. Plaintiff was of course annoyed at that, and called Defendant some ugly, hard names ; she stated that Defendant struck her, but two witnesses for the defence only heard him threaten to strike her with the beef. Defendant volunteered some very remarkable revelations in Court, not immediately connected with the assault; and the Bench said the case was one which should not have been brought to that Court at all, and dismissed it, at the same time cautioning Harwood not to go opposite Plaintiff’s house again for the purpose of provoking her. 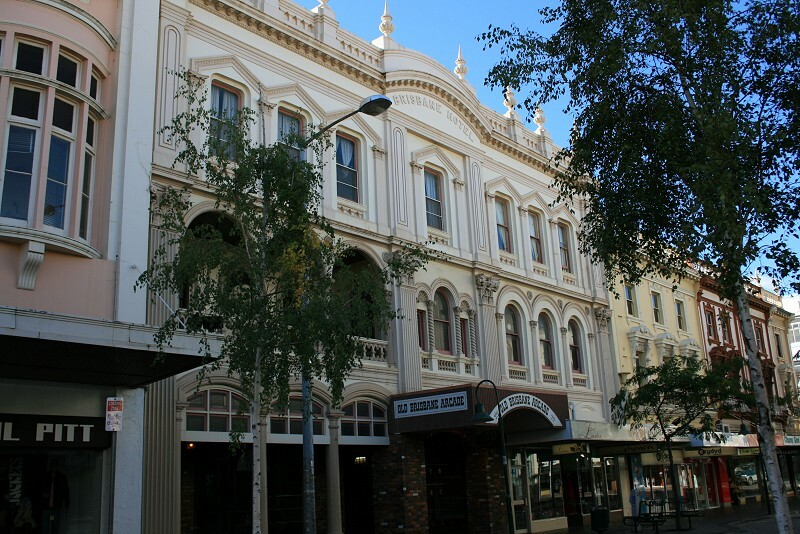 The recent extensive additions to the “Brisbane Hotel,” Brisbane-street, form the last of the improvements to which we are referring. It is due to the conductor of this hotel to say that under his management he long since effected a radical and necessary change in the character of the house and now the recent additions to the accommodation entitle it to rank with the best hotels in town. Finding the house as it was originally inadequate to meet the requirements of a class of customers from the country and the adjoining colonies for whose patronage Mr. Simmons was indebted to the improved style of management and accommodation, and having been applied to by several gentlemen desirous of securing a place at which an association formed on the club system could meet the proprietor has just completed the following additions to the house–a large billiard room 32 x 23 feet, a refreshment room and a club room connected with each other on the ground floor, and having over them nine additional bedrooms, with private parlours, bath rooms, &c. The lower rooms are lofty and well-proportioned, whilst in the sleeping apartments more care than usual has been taken with the ventilation, a matter too often overlooked. The rooms on the ground floor are to be occupied by the club now being formed; one room being devoted to billiards, one to refreshment, and the third, which is handsomely furnished, to the general purposes of the club. The improvements effected in the stabling of the “Brisbane” have been referred to on a former occasion. BILLIARD LICENSE. 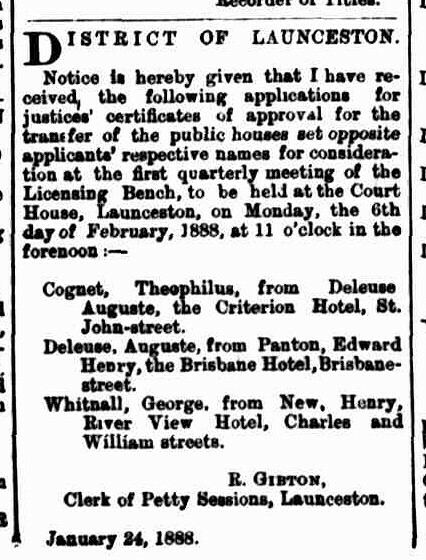 – At the Police Court yesterday, a billiard license was granted to Mr Joseph White Simmons, of the Brisbane Hotel, Brisbane-street. Hotel Changes. 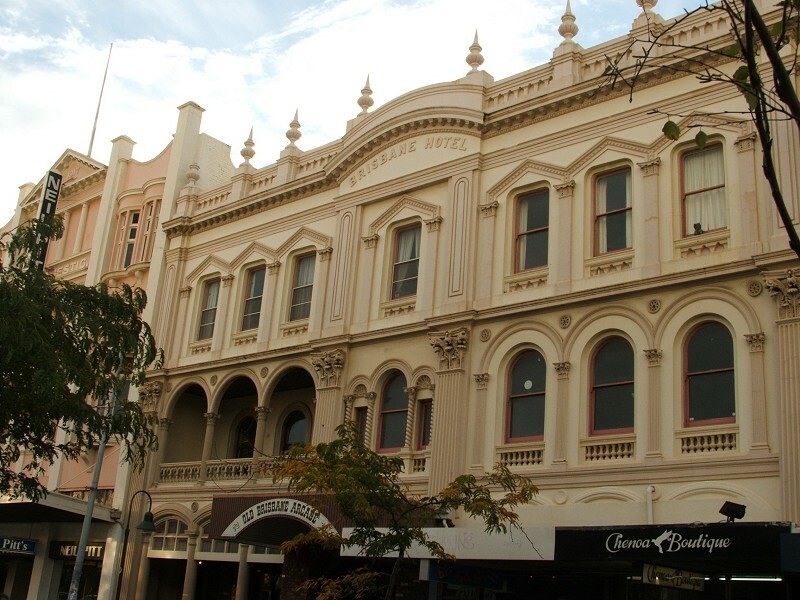 — The present season, though a dull one, is only the harbinger of more stirring times, if we may judge from the high prices at which several hotels in Launceston have of late changed hands. 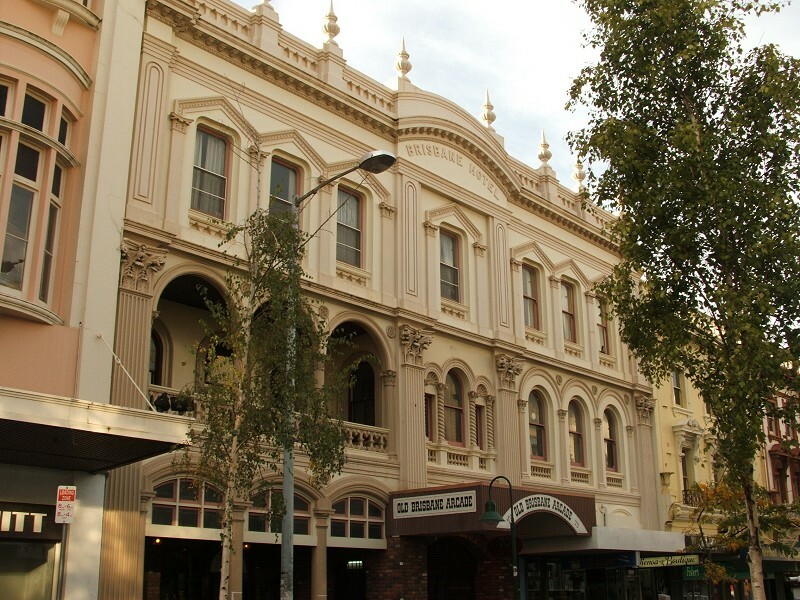 The Launceston Hotel, which was last year sold for £6500, has passed into the hands of Mr J. Huston, late of the Criterion Hotel, for £7500. This sum includes a new building in course of erection at the rear of the hotel, in place of the old wooden portion of the hotel that used to exist at the back of the premises. 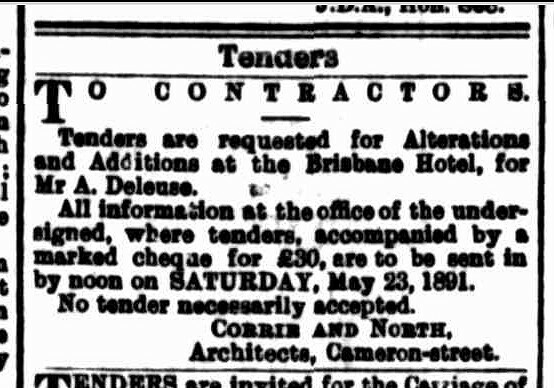 The lease of the Criterion Hotel has passed into the hands of Mr A. Deleuse at a good rental, and now the old Brisbane Hotel will lose the owner who has so long conducted it, Mr J. W. Simmons having sold it to Mr E. H. Panton for £7000, including the fittings, though exclusive of the furniture, and in another month will vacate it. His departure will make the hotel seem strange to those who have frequented it for many years past, while it will also lose its present homely appearance, and be transferred into a more modern-looking hotel by means of a verandah and balcony in front and extensive additions at the rear where the present yard is. 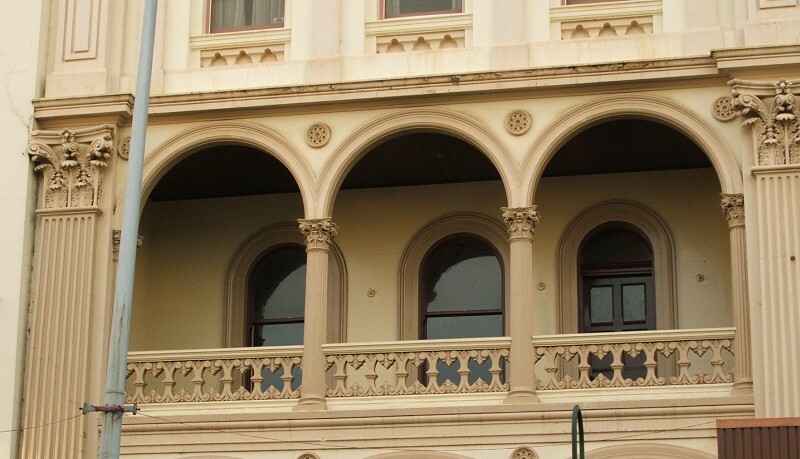 The Brisbane Hotel. 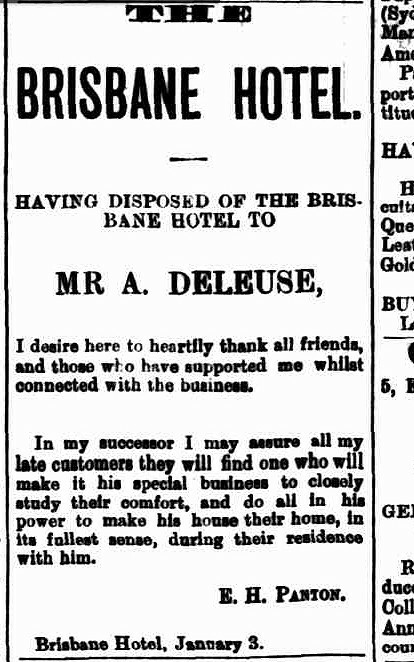 — We understand that the Brisbane Hotel, which has for many years been recognised as one of the leading hotels in Northern Tasmania, has again changed hands, the purchaser being Mr Auguste Deleuse, the widely popular host of the Criterion Hotel, who has, since he came to reside in Launceston, made many worthy friends. The price paid was £10,000. Fire Alarms. — About noon on Saturday an alarm was rung out from the Brisbane-street Fire Station, and shortly after the reels were run out and drawn up the street opposite to the Brisbane Hotel. Smoke was noticed to be issuing from the roof at the rear of the building, and directly over the billiard-room. The firemen quickly ran a ladder up, and one of their number, mounted to the roof and discovered that the rafters around a chimney had taken fire. The hose was directed to the spot, and the fire was quickly extinguished. The members of the brigade acted very promptly under the charge of Mr. Superintendent Bennell, and the police rendered assistance by keeping the crowd back. Little damage was done by the fire, which was supposed to have been caused by a defective chimney taking fire. This entry was posted in Brisbane Street, Hotel and tagged location, photo by Xenith. Bookmark the permalink. Joseph Barrett was my great-great-great-grandfather it I am so pleased to read some factual history on the King’s Head and subsequent development of the site. I have never been able to find evidence of his owning an inn known as the Elphin Arms – this would appear to be a family story which was probably used to disguise the convict heritage. There are some brick walls remaining of the original building behind the shops currently built on the site. I just found your comment. For some reason I didn’t a notification about it. There is a lot of “odd stuff” written about the King’s Head/Brisbane & it took a while to work it out. I think that’s a reflection of the position the hotel held in the community, and its ghost still does through the facade. I’ll have to see if I can find the walls. I got excited when I found a photo of the street with a bit of the older building showing. Find the walls would be good! I have come across this web site as I am doing a University unit and am researching & writing a piece on Mary Barratt (nee Dodd) who was married to Joseph. I have found a lot of information about her’s and Joseph’s convict past, their son Abraham, but lost the trail of Ann. I am wondering if she is your ancestor and if so who she married? I would be very pleased if you could contact me at the address below.